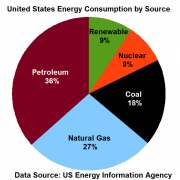 US energy consumption as of October 2013. Photo: Delphi234; Wikimedia Commons. 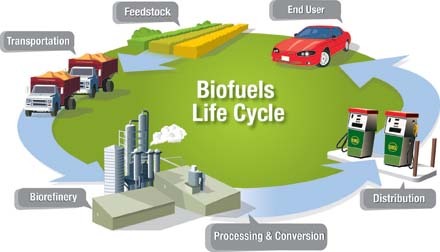 Explore life cycle analysis to gauge biofuels’ benefits. Life cycle analysis (LCA) is a tool used to account for inputs and outputs to complex systems. In essence, it is a budgeting process that accounts for all inputs (raw materials and energy) and outputs (products, waste materials, and environmental impacting components such as CO2). Some effective models have been developed for life cycle analysis, including these for biodiesel. A major challenge with LCA budgeting and interpretation involves identifying appropriate analysis boundaries. For example, when determining energy input to produce bioethanol, should the energy required to manufacture the tractor tires used in the field that produces corn be included in an energy input analysis? Should the energy required to manufacture the truck that transported the tires to the producer be part of the analysis? Equitable, consistent, and scientifically defensible assignment of boundaries to an analysis is required for an LCA that can be defended. At this time, however, there are no clearly defined boundary delineation rules for LCA, making selected LCAs somewhat subjective or argument-based, compared to other science-based research tools. Somewhat frequently, “cradle to grave” is used to describe an LCA, suggesting it is all inclusive. Unfortunately, the boundary issue remains and, unless boundaries are clearly articulated, even “cradle to grave” analysis can be subject to variable results. LCA is often used to compare energy and carbon balances for production and use of different fuels. As such, LCA is a key tool used in assessing sustainability of biofuels. For example, U.S. policy provides tax credits for companies that blend renewable fuels with petroleum-based fuels. In order to qualify for these credits, carbon dioxide emissions must be reduced by 40% for first-generation biofuels and by 60% for second-generation biofuels used in the blend. LCA is the tool used to determine level of emissions reduction or increase associated with production and use of each fuel type and therefore their acceptability for tax credit. Boundary identification in these determinations plays a major role. Also under debate currently is the question of whether indirect land use change should be included within the boundaries of the LCA. As current rules and legislation are written, boundary issues associated with LCA, and the LCA itself, are key players in development of this industry.